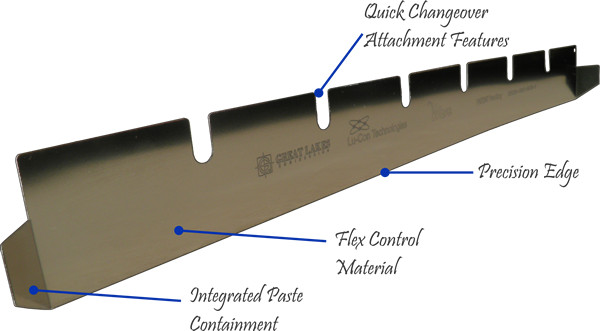 Squeegee Blades | Great Lakes Engineering, Inc. Here at Great Lakes Engineering, we strive to continue to offer our customers the products they need and desire. This has been what has kept us at the top of the industry for the last 20 years, and what continues to push our company forward into the future. This is exactly why we continue to expand our product line into new territory and carry products from companies like Henkel and also these squeegee blades. Developed by Lu-Con Technologies of Flemington, NJ, Great Lakes Engineering announces the introduction of the Wave Glide™ innovative new Squeegee Blade designed to offer users a number of advantages over conventional squeegee blades. Great Lakes Engineering has become an official squeegee blade manufacturer of Wave Glide blades. These blades make excellent squeegee replacement blades because they are strong and affordable. The Wave Glide™ Squeegee Blade is designed to be custom fit to any blade holder on the market today using slots, not holes, eliminating the need to completely disassemble the blade holder when the blade needs replacement. Squeegee replacement blades can be difficult to install, but with Wave Glide squeegee replacement blades, the job is quick and easy! Due to its entry level design, the Wave Glide™ is a drop—in replacement for virtually any other blade you may already have in your application. And because it utilizes paste management technology, it removes the need for set up procedures and other issues. This makes it incredibly easy to install & run while lowering the amount of waste in your facility significantly. Its unique Integrated Paste Containment Wing requires no setup or operator involvement, virtually eliminating paste tram-lines or paste seeping out behind the guides. No more fiddly deflectors for operators to deal with that just end up getting removed and thrown away. The result - Less paste required for good printing results with users reporting paste saving of up to 250 grams per job! The Wave Glide™ Squeegee Blade is easy clean up as there are no nooks or crannies to contend with. Great Lakes is certainly the best flexible squeegee blade manufacturer on the market. If your business needs squeegee replacement blades, look no further! Lu-Con Technologies is a company focused on developing products and technologies designed to deliver high value and functional performance in the electronics manufacturing arena. Products are currently focused on the improvement of deposition technologies but in time will expand into all aspects of the electronics manufacturing industry. For more information, visit www.lu-con.com. About Great Lakes Engineering, Inc.
Great Lakes Engineering, Inc is a trend-setting manufacturer of surface mount stencils, precision laser cut parts, photo chemical machined and electroformed stencils and thin foil parts for the defense, medical, electronics, aviation, energy, computer, and telecommunications industries as well as squeegee blade replacement parts. Great Lakes Engineering, Inc. is ISO 9001:2008 certified and ITAR registered company and distributes for Henkel Electronics. For more information please call 763-425-4755 or email info@greatlakeseng.com.